The main reason my luggage is so heavy when I leave Columbus after Cinevent every year is the number of books I buy there. Lobby cards, stills, sheet music, even DVDs can weigh next to nothing, but books — that’s a whole other kettle of bound pages. There are books old and new on offer there, and two of the new ones I picked up this year should find a place on any well-stocked cinema bookshelf. My friend John McElwee’s Showmen, Sell It Hot! 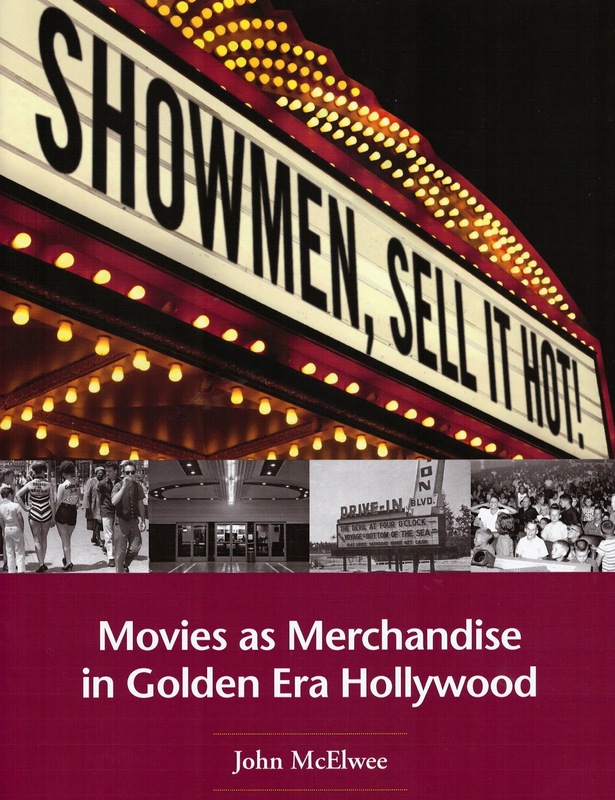 : Movies as Merchandise in Golden Era Hollywood all but beggars description. John is the proprietor and sole contributor to Greenbriar Picture Shows, the premier classic movie blog — this in a field simply chockablock with first-rate blogs. If you haven’t bookmarked John’s blog, you should, before you read another word of this one. John has a particularly keen interest in the advertising and promotion end of things — that is, as it was practiced on a theater-by-theater basis back in the days before coordinated multimedia campaigns for movies opening simultaneously on 6,000 screens all over the nation. That’s the focus of Showmen, Sell It Hot!, many of its chapters drawn from — and expanding upon — posts he’s made on the subject over the seven years Greenbriar’s been going. It’s especially fascinating to see how small-town theater owners used to ballyhoo their coming attractions; urban exhibitors could wait perhaps a week for word of mouth to kick in, but it was a whole different game for houses where the bill changed every two or three days. At that level, promotion was very much a seat-of-the-pants operation. Not that the book neglects the major urban and studio-driven campaigns. There are also chapters here on the selling of the sensational new pairing of Fred Astaire and Ginger Rogers in 1933’s Flying Down to Rio (at the time, it was a toss-up which word in the title was more exotic, “Rio” or “flying”); the incredibly long “legs” of 1939’s Jesse James with Tyrone Power, Henry Fonda and Randolph Scott; the Marx Brothers’ second movie career at MGM, beginning with A Night at the Opera; the unexpected success of King Kong in its 1956 reissue; MGM’s conundrum over what to do with Saratoga (’37) when Jean Harlow died during production; likewise Warner Bros.’ scramble to sell James Dean’s posthumous pictures; the promotional campaigns for What Ever Happened to Baby Jane? and Bonnie and Clyde; and more. Written in John’s breezy vernacular style reminiscent of both Variety and Time Magazine in the 1930s, Showmen is a mine of amazing information. John makes the surprising — yet entirely logical — point that in the 1930s, installing air conditioning could do more for a theater’s bottom line than CinemaScope, 3-D or stereophonic sound 20 years later (“A lot of people went to the movies just to cool off, never mind what was playing.”). And he ferrets out eyebrow-raising information on individual pictures’ budgets and box office take. Did you know that the Marx Brothers’ Duck Soup cost Paramount more than MGM spent on Grand Hotel, or RKO on King Kong? That the Brothers’ biggest box office hit was A Night in Casablanca (hardly their best)? I didn’t, but John’s got the figures here (heaven only knows where he finds them). It’s always an exaggeration to say somebody knows “everything there is to know” about a subject, but when the somebody is Richard M. Roberts and the subject is Hollywood comedy, it’s really not all that exaggerated. For years now Richard has been one of the go-to guys for Cinevent’s program notes, especially when it comes to 1920s and ’30s comedy: the Laurel and Hardy shorts sprinkled here and there all weekend, the annual tradition of spotlighting three Charley Chase shorts, and so on. He performs similar service for Slapsticon, the annual festival of silent-to-early-sound comedy that’s coming up on its 11th installment at the end of June (at a new venue on the campus of Indiana University in Bloomington). So if Richard does not know everything there is to know on the subject, it’s not for want of trying to find out. And he’ll probably never give up. Which is good news for us, because his new book — the first in a proposed trilogy — makes us the beneficiaries of his efforts (and those of co-researchers Robert Farr and Joe Moore). 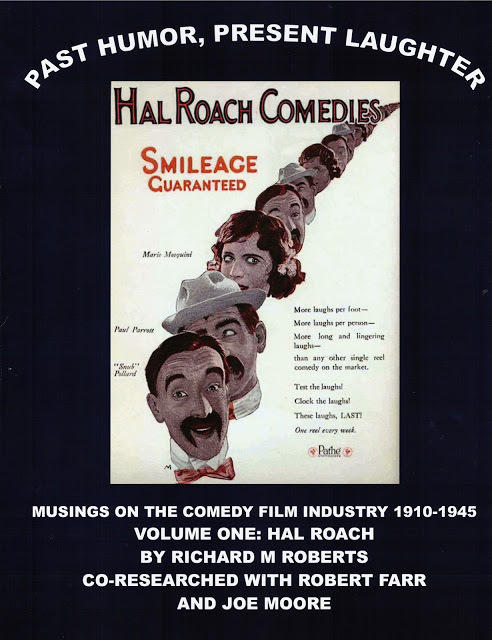 Here comes the title (brace yourself, it’s a long one): Smileage Guaranteed: Past Humor, Present Laughter: Musings on the Comedy Film Industry 1910-1945, Vol. One: Hal Roach. As Scott Eyman points out in his “Big-Time Celebrity Intro” (Richard’s title, no doubt), it’s simply insane that Hal Roach managed to live a hundred years without anyone ever writing a comprehensive biography. After all, here was the man who gave us Laurel and Hardy, Our Gang and Harold Lloyd; jump-started the careers of directors like Leo McCarey and George Stevens; and as Scott puts it, “more or less invented situation comedy as we know it”. Hal Roach has been gone 20 years now, and that biography still hasn’t turned up. Smileage Guaranteed may be as close as we’re likely to get. It’s not a biography, but it’s definitely comprehensive: a player-by-player, picture-by-picture, year-by-year survey and appraisal of the output of the Hal Roach Studios, the “Lot of Fun”. Richard spends relatively little time on Laurel and Hardy, Lloyd or the Our Gang series; they’ve been amply covered elsewhere. Instead, the profusely illustrated Smileage Guaranteed concentrates on other performers on the Roach lot — Snub Pollard; Will Rogers; Max Davidson; the Parrott brothers, Paul and Charles (the latter of whom began as Roach’s ace director, then moved in front of the camera to gain stardom as Charley Chase); Harry Langdon at the beginning of his long career decline; Mabel Normand at the sad end of hers; and on and on. Not all of Roach’s brainstorms were as felicitous as Laurel and Hardy and Our Gang, and Richard covers the misfires as well — the Taxi Boys, for example, and the bizarre clown Toto (ne Armando Novello). Fully 188 pages of the book’s 502 are devoted to an exhaustive filmography of every title Hal Roach produced (over 1,000 of them), followed by further filmographies for two of Roach’s major (albeit secondary) stars, Charles Parrott (aka Chase) and the Jewish comic Max Davidson. All in all, Smileage Guaranteed could well warrant another subtitle to go with all those it already has: More Than You Ever Imagined There Was to Know About Hal Roach. Written in Richard’s wry conversational style, it is, like Roach’s studio, a lot of fun. And there are two more volumes to come. These two tomes were my major acquisitions at Cinevent this year; between the two of them they took up three pounds and 234 cubic inches of my luggage. I’ll talk about some of the others next time. Wow, praise indeed Jim, and thank you for the wonderful words regarding my book. That they come from one as knowledgeable as yourself is truly humbling. It was also a pleasure to be unveiling the book along with John McElwee's extremely fine volume at Cinevent, not only for the fact that it meant we got to spend even more time together than we usually do as we sat behind the authors table, but because we both had a good product to sell. Thanks Again Jim, and keep up the great work on your fabulous blog.